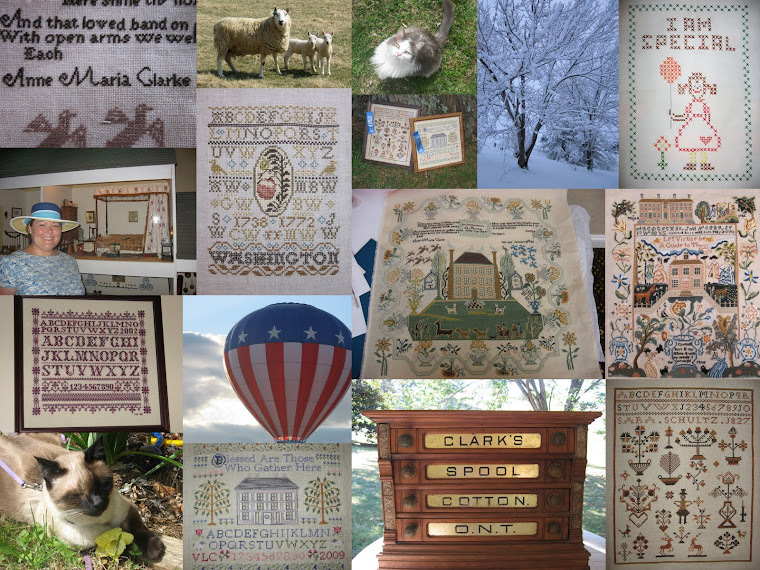 A Shenandoah Sampler: Sara is finished! Happy Sunday everyone! Sara Schultz is finished and now I have two 2010 finishes! She was a joy to stitch and considering I started her on January 5, I think she was a quick stitch too! I actually finished Sara around midnight on Friday, Jan 29. I had every intention of posting her yesterday but as luck would have it, I came down with a terrible 24 hour stomach flu, fever and all, just a few hours after my last stitch on her. So yesterday was spent on the couch oblivious to the snow falling outside. I am MUCH better today and just finished ironing Sara...here she is! Thank you to everyone who has been keeping up with her! I greatly appreciate your postitive comments and enthusiasm! I can't think of the last time that I finished two projects in one year. I am so thankful to have found this blogging community and its wonderful stitchers. It has been a blessing to find others who share my hobby. I have always enjoyed stitching but there aren't many people in my area that stitch. So, it is easy to get out of stitching when it seems no one is interested in what you do. Now, I have a whole community of wonderful people who are interested in what I do and it has meant the world to me! Thank you so much! I hope that everyone has a great rest of the weekend. I am off to finish my research papers for class...yuck. I will post my new project VERY soon! Till next time...Happy Stitching! Valerie, your Sara turned out great! Sorry you were ailing yesterday during the snow! Looking forward to seeing your new start! Valerie, she's lovely!! Congratulations on the finish. Sorry to hear that you were so unwell yesterday, stomach flu is just the worst. Looking forward to seeing what your next project is! Fantastic finish, I really love the colours! Congratulations! Congratulations Valerie! It looks fantastic! Sorry you were sick. Isn't it the pits?! We have snow here too. There were 10 wrecks that my husband spotted on his way home from work on Friday. Glad it's melting some! Can hardly wait to see what you are working on next. I have started 4, you read right, 4 new projects this weekend! So glad that hubby stitches now, he has been a lot more patient with all these new starts since he now is beginning to understand why I do it! LOL! This stitching blog community has me really got me stitching alot too. I have no one that has really no interest in it either. Sara is beautiful, congratulations!! Can't wait to see what's next.